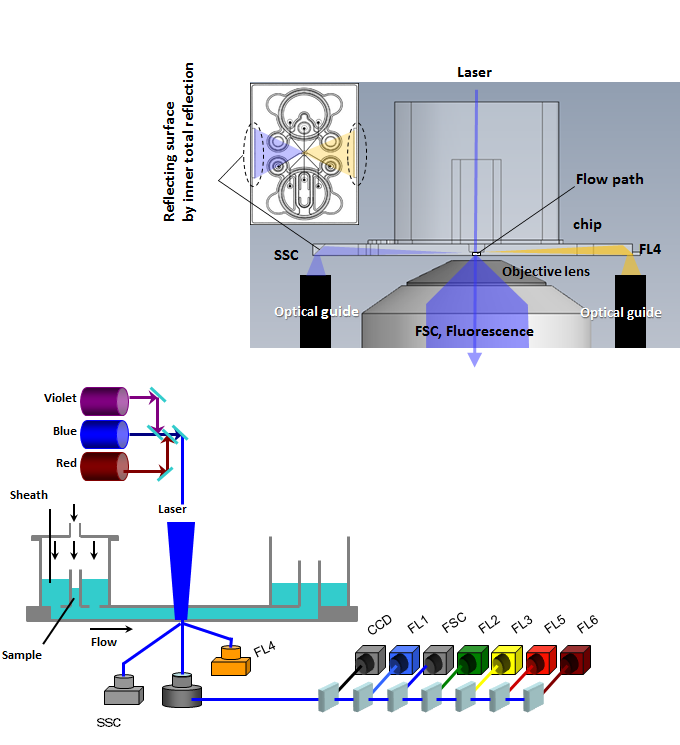 The construction of the microfluidic channels achieves narrowing of the sample stream down to 10μm or less by hydrodynamic focusing. Cells are aligned in a line for detection of individual cells using lasers irradiated from the top of the chip. Forward scatter (FSC) and majority of the fluorescence are detected through objective lens underneath the chip. Side scattered light (SSC), on the other hand, travels through the chip material and reflected at the edge slope (figures below). On-chip Sort can hold maximum of three lasers from the option of: blue (488nm, primary), violet (405nm), green (561nm), and red (637nm). FSC, SSC and six fluorescence colors can be detected.